April Is shaping up to be a really big month for massive smartphone releases as iPhone rival–Samsung’s Galaxy S4–joins the HTC One on store shelves April 24! It will be released through U.S carriers such as T-Mobile, making it the first U.S carrier to offer the phone. It is sure to move many, many units for the carrier in-store with the three day head start. 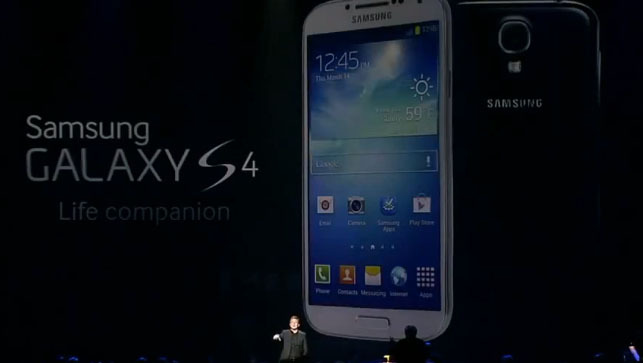 Samsung stated that a total of seven U.S carriers are said to be offering the Galaxy S4. Sprint Nextel and AT&T will be offering the popular phone on April 27 and April 30 respectively while U.S mobile juggernaut Verizon Wireless has yet to set a date for their Samsung Galaxy release. Unveiled last month, the Galaxy S4 looks to really loosen the iPhone’s grip on the U.S market. Sporting a larger screen, higher-resolution camera, and faster processor–just to name a few of its features—are sure to have Apple double checking their work and comparing it to Samsung’s here. Apple does have enough time to top this as the next iPhone isn’t due until later this year. Carriers and stores have been clamoring to get in on the awaited phone with Wal-Mart offering the Samsung Galaxy S4 at $168 granted customers get a two-year contract with AT&T. Meanwhile Sprint will sell the phone for $150 with a new contract while current subscribers are looking at $250. T-Mobile will be jumping in first with the Galaxy S4 and are using it as the main event for its new UNcarrier approach (Simple Choice) and will be offering it at $150 with monthly payments. With the combination of this new appealing approach from the traditional, stifling 2-year contract, being the first one out the gate with the smartphone, and having another hot phone up for release the same day T-Mobile could possibly see a jump in position among U.S carriers. Samsung looks to be use the Galaxy S4 to appeal to more customers than their Galaxy S3 model with a couple of improvements such as 20 percent longer battery life as well as front and rear cameras allowing for picture-in-picture photos.